This is what happens when you get the Raw Vegan to do the snacks for friday drinks at the the office. Kumara is an iconic New Zealand vegetable and a staple of traditional Maori cooking. It’s also known as sweet potato in the northern hemisphere and comes in a variety of colours and flavours. It’s rich in anti-oxidants and one of the top potassium rich foods. Kumara is also high in vitamin A and C and full of fibre. You could really use any colour, the orange ones are just much sweeter than the red, white fleshed kumara. Peel the whole kumara into thin slices with a potato peeler. I have found this works better than my mandoline, it gets the slices much thinner. 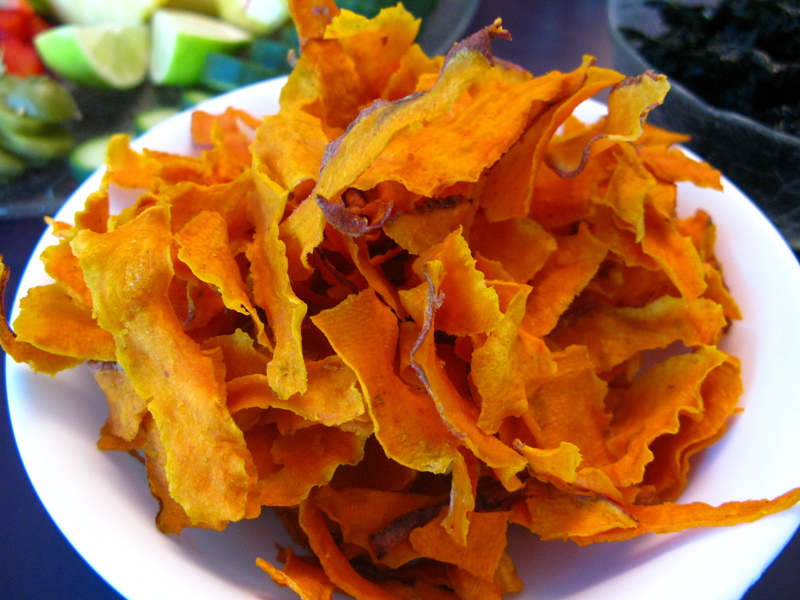 Cut or break the slices into smaller chip sized pieces and place in a large bowl. Add olive oil, salt and paprika and massage with your hands. Layout evenly onto mesh dehydrator trays and dehydrate at around 43degrees celcius/110 degrees farenheight for 12 hours or until cripsy. I just found your blog. It’s awesome! Great pictures and recipes. Can’t wait to try the linguine with pesto. But will make the tomato basil soup first :-). Thanks! I am in Wellington, yes. Your blog looks great too! My 7 years old daughter loves them too!!! looks like i missed out again – these are tasty numbers!!!! Yum!! Just bought the purple variety from my local health food shop and now you’ve provided me with the recipe! Can’t wait to make my own. Thanks!